Home / Project 365 / Project 365 - January / 1/365 - breakfast of champions. 1/365 - breakfast of champions. We stayed in for New Year's Eve - rented a movie, ordered pizza, and sipped on sparkling cider out of champagne glasses. Gray was certain he would be up until midnight, but was sound asleep by 8:47. I, admittedly, did not make it until midnight either. Anyway, photo one of 365 was taken first thing in the morning on the first day of 2014. 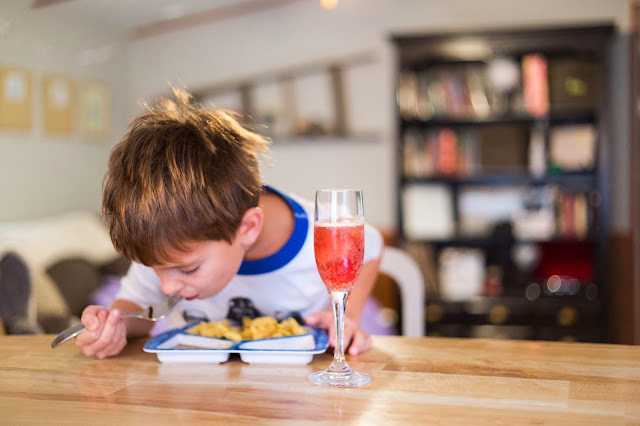 Gray requested waffles and sparkling cranberry apple juice in a champagne glass...someone is getting all fancy on us.